The project I completed with Ubiraci Santos in Brazil in September, the album Ritmeloxá with him playing percussion and myself on soprano saxophone, was based on an improvisatory and rhythmic affinity between us and on several conceptual objectives and opportunities. 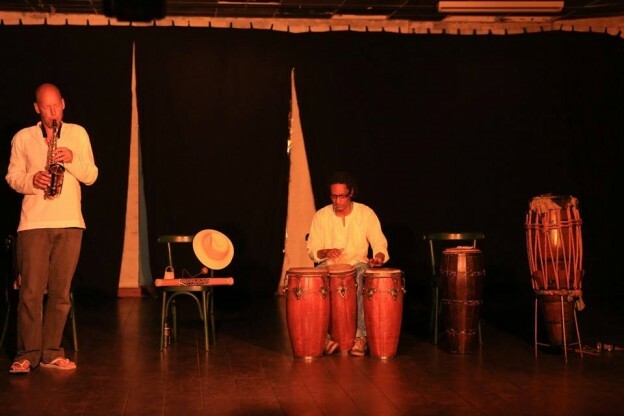 While rhythm with melody is a kind of default state in Afro-Brazilian music, it also offers the possibility of modal extrapolation and freedom of melodic line. I have been exploring modal ways of thinking, composing and playing, influenced to some extent by Arabic and Indian music. I also have a research interest in the modal approach of Ralph Vaughan Williams and experience as a performer of the modal jazz of Miles Davis. Taking a modal approach means not thinking in terms of a chord progression, or a serial tone row. Instead there are a number of available pitches and a line can develop according to certain criteria, or simply in free improvisation. In Indian and Arabic music pieces often explore the range of pitches gradually, proceeding from a narrow compass around a tonic and exploring upwards as if climbing and celebrating the attainment of various important notes. Indian ragas also have particular figures or phrases which appear in the course of the improvisatory development. In Western modal music as used in mediaeval plain-chant and renaissance polyphony, for instance, there are rules about the direction the melodic line should take at particular points. There are certain modes which are extremely common in popular and traditional musics around the world. Pentatonics (which make up much Chinese music) and the Dorian mode are the most often heard. The Oxóssi piece on the album for instance uses a minor pentatonic mode. The melody is a traditional Candomblé chant sung to me by Ubiraci which I subsequently transcribed and memorized. In the improvisatory section I keep mainly within the mode, occasionally extending it with ancillary pitches. It has a repeated phrase at the end of the melody which acts as point of rest and a pivot before the whole tune repeats. In my conversations with the Candomblé priestess of Ubiraci’s terreiro (place of worship) she told me that this music calls the Orixá (deity) and energises the people to receive him. After attending a ceremony at which Ubiraci led the drumming he pointed out that he was interacting with the dancers when he played, and particularly to the force of the Orixá in them. In a musical sense his experience and ability to do this informed our interaction as players and improvisers, being sensitive to each others expression and responding to it. This entry was posted in Brazil, Music and tagged Candomblé, improvisation, melody, modal approach, new album, percussion, sax, Ubiraci Santos on September 24, 2014 by Jochen Eisentraut.